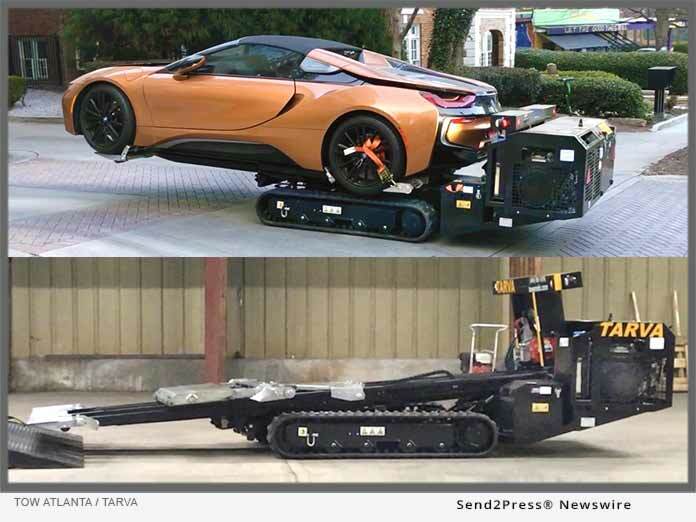 ATLANTA, Ga., Mar 01, 2019 (SEND2PRESS NEWSWIRE) -- Tow Atlanta is proud to announce the arrival of TARVA, Tow Atlanta's Recovery Vehicle Autobot-Robot that goes into low clearance parking decks/garages and other tight areas where vehicles may become disabled and physically carries them out. TARVA is only the second robot from EasTract (a French Company) to be operational in the United States. TARVA specializes in Parking Garages that are between 5 and 7 feet in height and also Vehicles without keys or locked steering columns. It also has a track system to move and a winch, so it can go into muddy area's and pull vehicles out as well as carrying cars from the side and lifting motorcycles off the ground. Tow Atlanta is the only Towing Company in the State that offers enclosed towing services and provides Certified Consensual Towing Services to Vehicles at the motorist's request. Tow Atlanta specializes in the Towing of Luxury, Exotic and Antique Vehicles and is the Official Manufacture Tow Provider for Audi, Bentley, BMW, Ferrari, Karma, McLaren, Lamborghini, Porsche, Rolls Royce and Tesla. * Tow Atlanta proud sponsor of the 2019 Atlanta Concours d'elegance.